The roaring VROOOOM sound of engines and outstretched mountain passes in the Indian Himalaya, It is a zone emphatically masculine!! Chains, panniers, leather boots, bandanas and biceps, everything seemed to be in their place. 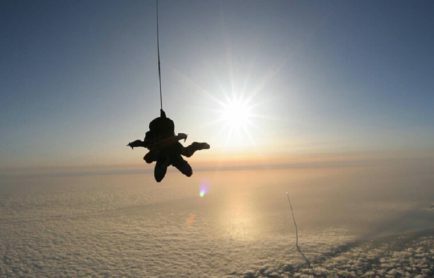 And when the men rode on these winding high passes leaving behind clouds of dust and images in motion, surely many of us were awe-struck,. But where they were heading was a matter of pride. From Ladakh to Sikkim, a slew of enticing mountain escapes conjures up visions of excitement among the riders. 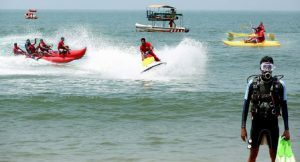 Adventure runs in their blood and they live every moment of their expeditions with dignity. Zip through these highest motorable mountain passes in Indian Himalayan and discover what sets motorcycle tour in India apart from the rest of the world. Ladakh, the land of passes, is blessed with the most elevated mountain passes of Indian Himalaya, some famed and some lesser-known ones. And the new entry to this amazing world is Marsimik La, standing at a height of about 5679 meters. It is a lesser-known conqueror on the map of Himalayan Range and lies northeast of Khardung La (the undisputed king of passes whose authority is now challenged by Marsimik) and below the range of Karakoram in Changthang. 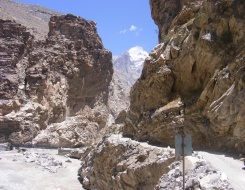 Unlike other motorable mountain passes, Marsimik pass is mainly used by the Army authorities to carry food and other supplies to border posts. Conquering the territory of Marsimik La is not an easy task, even for experienced bike riders. Several bumpy phases, sandy tracks and stiff incline give both the biker and the bike a rock and roll challenge to succeed. The expedition will leave you completely drained and that’s why the GO-GETTING SPIRIT is the foremost thing that riders require. The first major halt of Marsimik La expedition comes at Phobrang, the camp site of ITBP and the place where bikers have to remove their entire luggage (except tool kit). The pass lies 22 km ahead from Phobrang. The first 18 km ride is relatively fine and straight with only some loops and mountains. But the sand and loose dust will definitely give you a headache. Do not take this easy-going ride for granted as the appearance of a sudden steep climb during the last 4 km of the journey will put all your physical strength and mental toughness to the test. 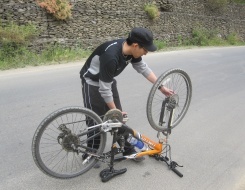 The most exigent phase of the expedition is the last 3 km where you have to push your by now almost dead motor machine. But once you overcome this stretch, the ecstasy of reaching Marsimik pass will definitely wash away the agony of the journey. 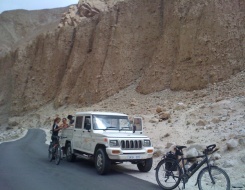 Note*- Bikers need to obtain entry permits from district authorities of Leh as Marsimik La is an inner line route. Start your expedition at 8’0’clock in the morning from Phobrang as before 8 temperature is quite low and past that high velocity winds start. Expedition Route: Leh – Chang La – Pangong-Tso (a small left dirt track few meters before Pangong-Tso is the entry point for the pass and is about32 km away from M-La) – Phobrang (base of ITBP camp) – Marsimik La. Tucked away in the rugged stretches of Himalayan Range in Uttarakhand, Mana Pass alias Dungri La stands out like a winner leading with an example among several competitors. Situated on the border between India and Tibet, the pass is located within the periphery of Nanda Devi Biosphere Reserve. Shake off the images of barren landscapes from your mind and leave behind those shaky rides, an expedition to Mana Pass is full of breathtaking sceneries of Uttarakhand. That’s why it is not wrong to call it the most beautiful mountain pass of Indian Himalaya. But give a break to your biking tour as Mana Pass is not open for civilians. The pass is only used by the Army and ITBP for carrying supplies to border posts. Feeling Sad? Do not worry! 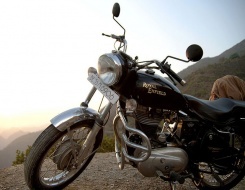 Recently, an 11-members team of Free Soul Riders drove all the way to the pass from Delhi via Rudraprayag – Badrinath. The closest settlement from Mana Pass is Mana, situated at a distance of 50 km. Mana village is just 3 km ahead from the iconic Badrinath Dham. 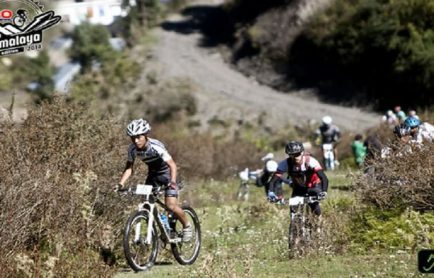 Apart from rejoicing every bit of your successful bike tour, Mana Pass also provides eye-catching views of Chaukhamba, a mountain summit of Garhwal Himalayan Range. 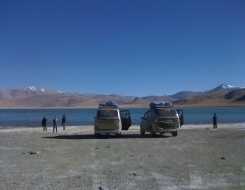 On the way, drivers can capture the beauty of Deotal Lake. Note*- Special permission is required for a drive to Mana Pass or Dungri La. Situated at an elevation of 5,359 meters (though it is mentioned as18,380 feet or 5,602 meters on the local summit board), Khardung La is situated north of Leh on Ladakh Range. Every year hundreds of bike enthusiasts fulfill their dream of making to the pass also known as world’s highest motorable pass. But, it is a NEWS of the PAST!!! The authority of this ruling king can now be challenged. 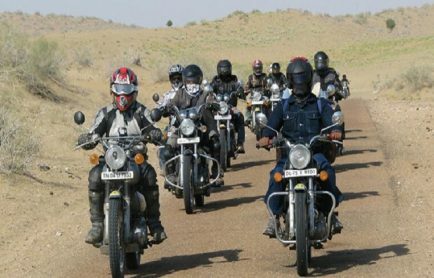 BUTTT the thrill and excitement that riders will experience on this expedition can never be defied and this makes it a dream destination of every biker. 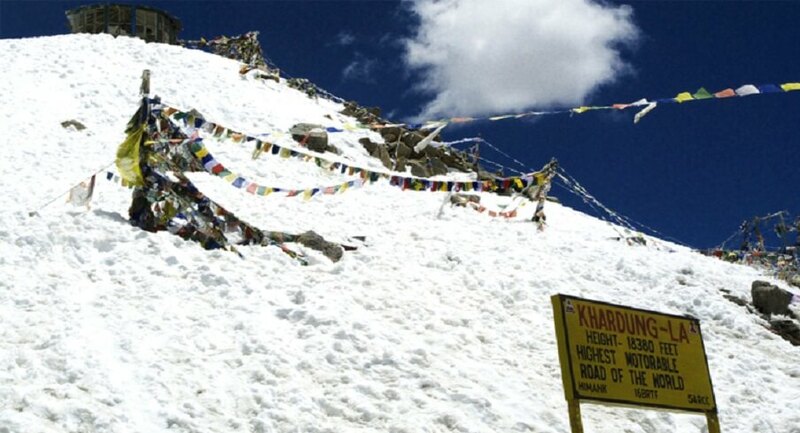 The expedition for Khardung La mainly starts from Manali in Himachal Pradesh and is considered one of the trickiest routes in the world. Miles of barren landscapes, small settlements, meandering rivers, and fatigued muscles and engines will be your only partner on this journey. The testing phase of your patience is not over here. This motor bike tour will let you come across five other notable mountain passes of Himalaya (Rohtang, Baralacha, Nakila, Lachung and Tanglang la passes), a well-known hair-rising group of loops (Gata Loops) and of course freezing cold. Gata Loops will incline you to aheight of 4,664 meters from 4,198 meters within a distance of merely 13 km. Along with these, other major stopovers falling en route are Gondla, Keylong, Sarchu, Pang, Upshi and Leh. Beside this route, riders can also begin their journey from Leh. 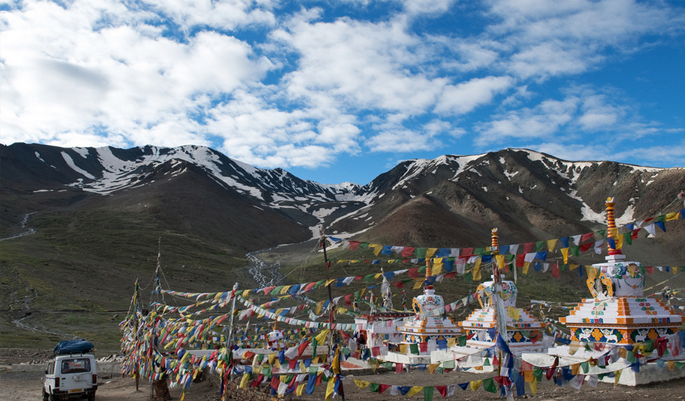 Leh is only about 39 km from Khardung Pass and there are direct flights that connect Leh with Delhi and Chandigarh. 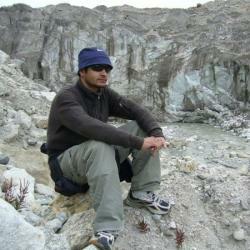 But flying to Leh will surely kill the real adventure of the trip. After spending an hour on Khardung La, head back to your hometown via Kargil and Srinagar. On this returning journey, explorers can also visit Drass town, which is known as one of the coldest regions in the world. Note*- Follow the same route for expeditions to Tanglang (5,325 meters) and Lachung (5,060 meters) passes, two top motorable mountain passes of Indian Himalaya. A trip filled with an overdose of natural beauty and over a long strip of narrow yet well-built road that smoothly transforms into expectedly bumpy will bring you to Chang La. Falling on the way to Pangong Lake from Leh town, the pass is considered as the gateway for Changthang Plateau, a land marked with vast lakes and highlands. 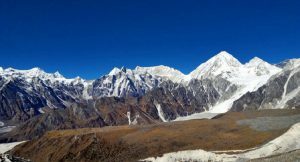 Though the way to this third highest motorable mountain pass in Indian Himalaya too is flanked by small settlements like other ones, the one thing that is hard to ignore is the long- lasting world of silence at Chang La. The route to Chang pass is the same as the one you will follow for Khardung La. You will experience the same cheers and difficulties up till Karu, the junction point from where the routes separate. 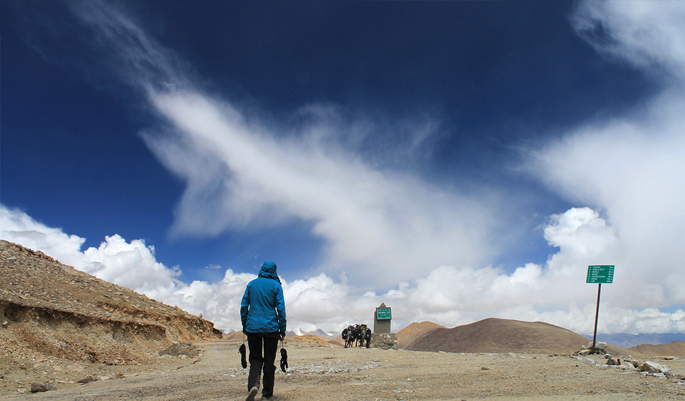 A right turn from Karu will take you to Chang pass, which is about 35 km from the junction point. Bikers can also visit Hemis Monastery, which is located on the left turn of the square at Karu. Another Buddhist Gompa that falls en route to the pass is Chemrey and the nearest settlement is Sakti Village. The more you come closer to your destination the more it will become difficult but not like most of Ladakh’s mountain passes that are tagged with fury of nature. With an elevation of 5,320 meters, Chang La expedition is less tiring for both men and machine. Riders can visit Pangong Lake, which is located just a few meters away from Chang La but this small journey to the lake will leave you completely out-of-gear. If you compare Kunzum Pass with the mighty and tough passes of Ladakh then you might not get that extreme level of adventurous feel. BUT, a drive to Kunzum Pass in the high altitudes of Himachal Pradesh gives every biker a memorable voyage of his lives. With an elevation of 4,551 meters, the pass lies on the eastern part of Kunzum Range of Himalaya and connects Kullu and Lahaul valleys with Spiti Valley. 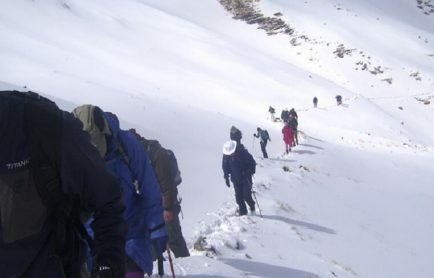 Start your expedition to Kunzum Pass from Manali, one of the main tourist destinations in Himachal Pradesh. The pass is situated about 129 km from Manali and en route you will cross traditional villages living in a world of their own and where life seems to move at its own pace. Casting a spell of magic over you is the changing hues – green to barren to snow white. Cross Rohtang Pass to reach Chatru, which stands as a soothing oasis amidst the cold deserted landscape of Spiti. 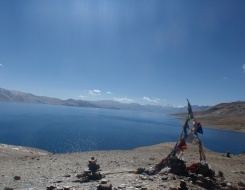 From there, move further to Batal, the starting point of the 14 km trekking trail to the moon lake ‘Chandra Tal’. Once you are at the pass, you can enjoy panoramic views of Bara-Sigri Glacier (the world’s second longest glacier) and can experience the rustic charm of Losar, the first inhabited village in the Spiti Valley situated at a height of 4,085 meters above sea level. 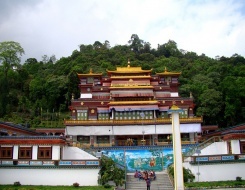 There is a temple located on the top of the pass and is devoted to Goddess Kunzum. In the return journey, bikers can enjoy night stay at the only tented rest house in Batal. From Gramphoo, drivers can either return to the starting point (Manali) or can go to Leh via Keylong, Baralacha La and Tanglang pass. If we speak of the top motorable mountain passes in India, how can we leave out the ‘Land of Lepchas and Bhutias’ from our diary of motorbike expeditions in Himalaya. 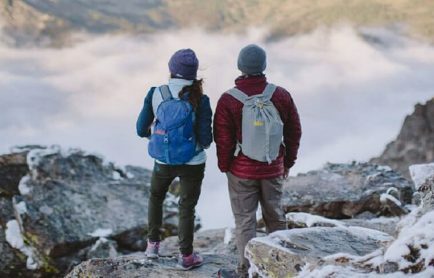 Known for its exotic natural beauty and cultural heritage, Sikkim always excites adventure seekers due to its elevated location and closeness to Tibet and China. 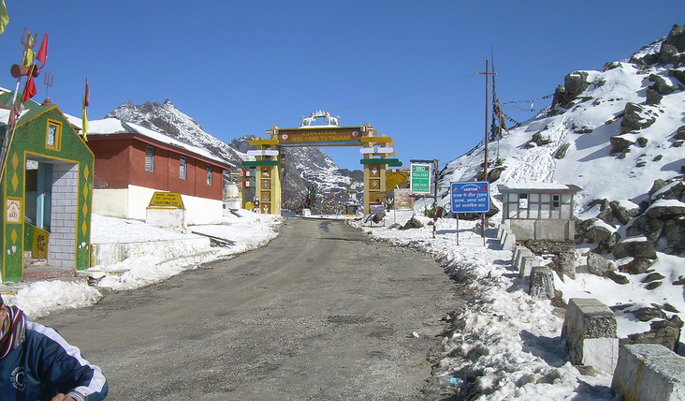 One particular pass of Sikkim that makes its entry into the world of elevated vehicle-accessed passes is Nathu La. Nathu La is located about 56 km from Gangtok and is placed at an elevation of 4,328 meters. 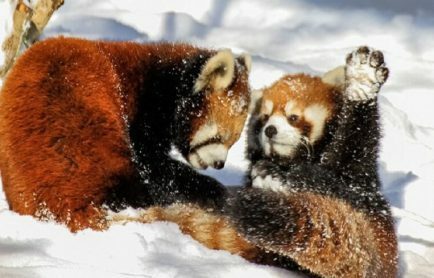 It is for sure that most of you will take this expedition very lightly and for some reason, it is true!! But the USP of this motorable journey is the en route beauty. 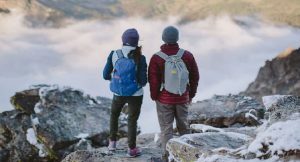 Panoramic views of surrounding alpine flora and mountains, freezing temperature and foggy weather will not let you think about anything else. Tsongo Lake situated at a height of 3,779 meters and falling on the way to Nathu La is a sight to behold. There is a metalled road but not in good shape. So be prepared for a jerky ride. 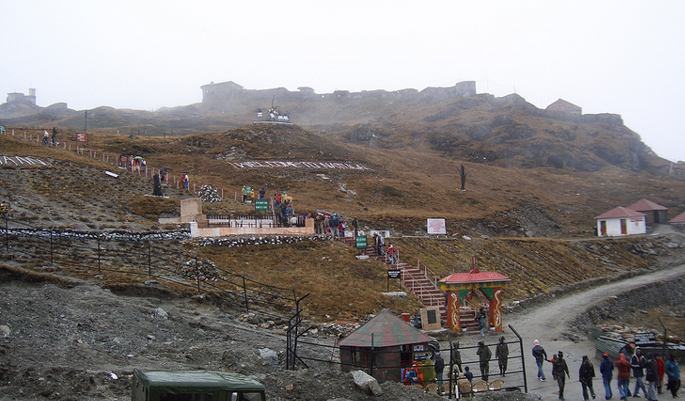 There is a war memorial built at the pass in the memory of Indian soldiers who sacrificed their lives for the country. Visitors can also see Chumbi valley on a clear day. Note*- Presently only Indian citizens are allowed to go close to the border and permits are required for an expedition to Nathu La. In a land like India where highways and thoroughfares flanked by rivers, fields, valleys and mountains rule the physical features, the thing that makes a difference is the MEMORIES OF THE JOURNEY. And this applies well to the elevated mountain passes of Himalayan Range that give every visitor a distinct story to share. SE LA, commonly known as Sela Pass, is one of these high-altitude passes that give motor bikers a reason to celebrate their journeys. Situated at a distance of about 78 km from Tawang town, Se La is much more than a mountain pass. 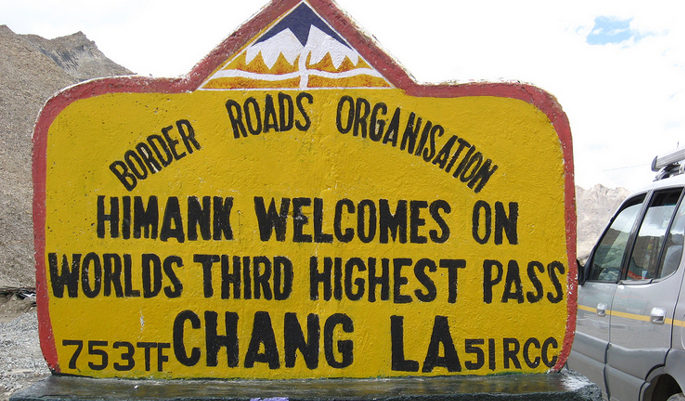 It is the only route that connects Tawang district of Arunachal Pradesh with the rest of the country. Located at a height of 4,175 meters, the brown barren mountains of Se La are often covered in snow for a major period of the year. There is hardly any sign of vegetation but still a bike expedition to the pass is full of adventurous memories with blue clear lakes falling en route and clouds portraying a dramatic scene over the horizon of the mountains. The innumerable hairpin bends give you a thrilling test and the surrounding landscape is truly eye-catching. Visitors can also visit Sela Lake and Jang Waterfall, located close to the pass. Sela pass remains open throughout the year except when there is heavy snowfall and landslides.